And now for something completely different (i.e. un-paleo)- bread! I think when most people consider a no-grain diet/no-sugar, the thing that they think they could not live without is bread. And I agree that bread would be difficult to give up, especially as a French-American woman. However, at the risk of sounding snooty about French bread, it would be much easier for me to give it up while living in the US than while living in France. Here in California, I just cannot find bread that’s on par with the bread you can get at any boulangerie in France. I guess I’m just spoiled in the bread department. I’m told that things have vastly improved since my mom moved here almost 30 years ago, and I’m sure they have. Now you can actually find baguette, rustic loaves, and even pretty good imitation “Pain Poilane” at Trader Joe’s (called, “Pain Pascale”). For the most part though, the good bread can only be found at more expensive stores or bakeries. For example: the day after I returned from Paris, I decided to stop at the Santana Row bakery, Cocola, to pick up a baguette to have with all of the yummy cheeses I brought with me. The baguette that would have cost me 0.90 € cost $3.00. Even with a poor currency rate, this was over double the price of the French baguette. PLUS, it wasn’t good. Anyway, enough with the bready rant. I have always been the type of person who tries to recreate things at home that would generally be left to the professionals (think, macarons). Bread is no exception. I’ve made many whole wheat sandwich loaves, but never thought it would be possible to make an artisan-type loaf without some serious research and time investment. Well the New York Times proved me wrong on this one. 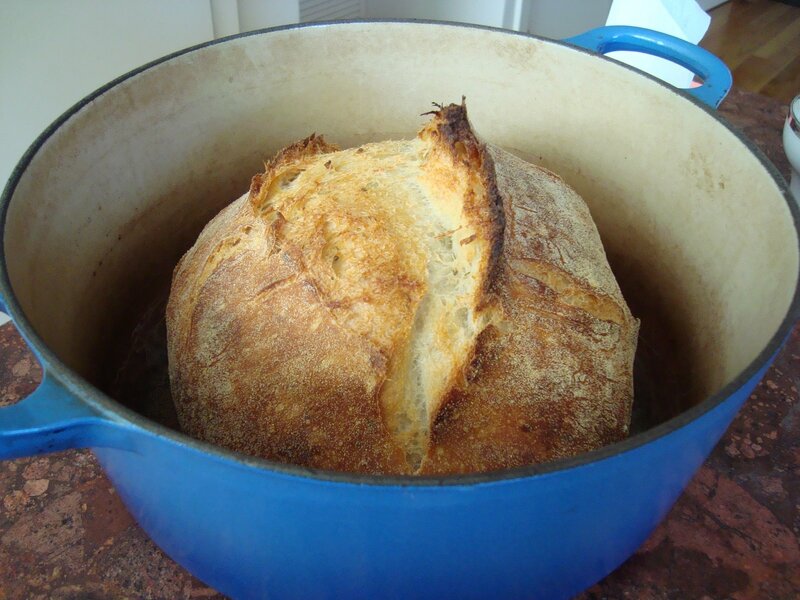 An article in November of 2006 featured a No-Knead bread recipe, adapted from a recipe used by Jim Lahey at Sullivan Street Bakery. I actually saw this article when it first came out, thought about trying it, and figured that this “no knead” phenomenon was probably too good to be true. So I never tried it out. I came upon it again in a William-Sonoma catalog and finally decided to take the plunge. How can a loaf of bread be “No knead,” you ask? Well here is the short answer: Gluten development is one of the necessary components in making bread. There are 2 ways of developing gluten. The first is by kneading the heck out of the dough, and the second is by waiting a really long time for the gluten to develop on its own. 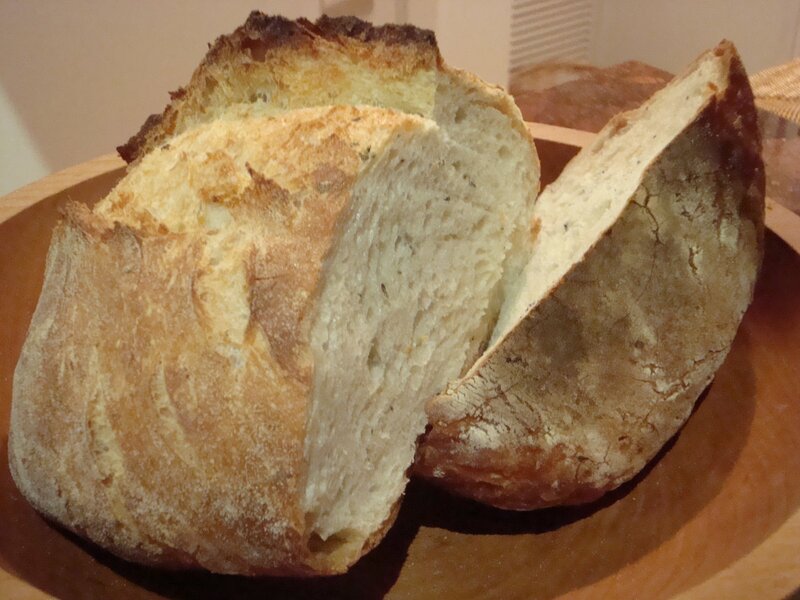 Most bread recipes use a combination of the two, and this one simply chooses the second option. Since the dough for this recipe must rest for 12-18 hours during the first rise, I suggest making it the night before. Basically, all this recipe requires is a little more planning than a kneaded loaf. I won’t repost the recipe here, since I really haven’t changed anything from the New York Times article. 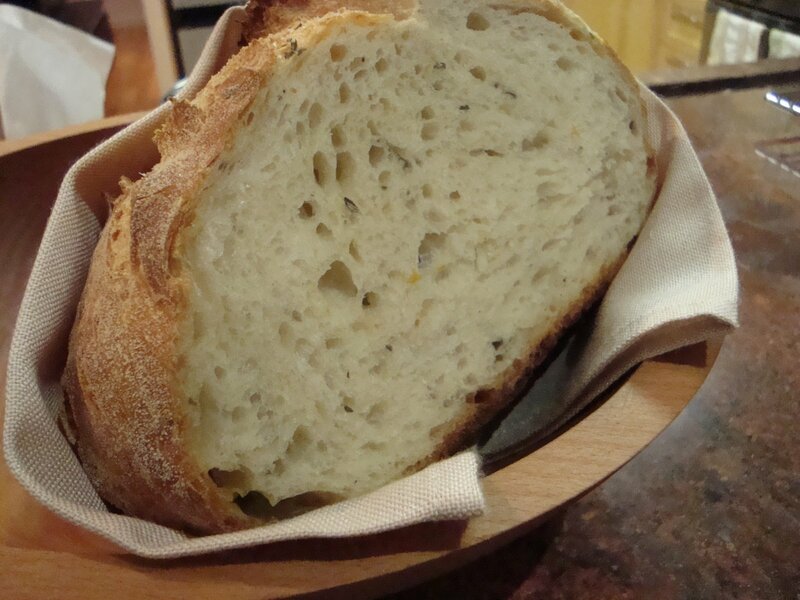 The only thing I would suggest, if you plan on serving the bread with a savory dish, is to add some chopped up fresh rosemary (or other fresh herbs) when you’re first mixing the dough. It gives the bread a nice flavor. Once you get a few successful loaves under your belt, try substituting some of the all-purpose flour with other types of flour such as whole wheat or rye. This entry was posted in Bread, new york times, sustainable on July 25, 2009 by seedsowingmama. 10. Being totally jet-lagged, waking up at 5am, and walking down to the corner boulangerie to pick up a piping hot baguette and croissants for breakfast. Check! This happened on many occasions while we were in Paris, though not always at 5am and not always while we were jet-lagged. Sometimes the piping hot baguettes come out around 6pm….and once in a while they make it all the way home to be eaten with dinner…or even breakfast the next morning. 9. Going to the farmer’s market to buy some melon and asking for one “for today” and having the farmer choose a perfectly ripe melon. Check! We made it to a few farmer’s markets. Although I must say the organic “Bio” farmer’s market was quite a disappointment. The cheese was good, but the vegetables we got from there were not fresh. The Ave de Sachs market is much much better. And the melon was amazing. 8. Espresso at every corner. Well, if by this I meant “drinking espresso at every corner” then I didn’t get this one. But there sure was espresso at every corner! I did partake in a particularly memorable espresso in a cute cafe in Montmartre, on top of a hill (even more so than most cafes already are in Montmartre), with an incredible view of Paris, but without the crowds of the Sacre Coeur. 7. Taking a picnic of baguette and rillettes to the Jardin de Luxembourg. Nope…got this one separately, but not together. We did visit the Jardin de Luxembourg a few times, but not during lunch time. We also had rillettes with baguette for lunch a few times. Maybe next time! 6. Nutella crêpes from the St. Michel crêpe stand. Also nope! Although I did have crepes on 3 different occasions during my 2 total weeks in Paris. We re-discovered a wonderful creperie called “Creperie des Canettes” on Rue des Canettes, near metro Mabillon. The crepes are delicious! For dessert I tried the simple “sugar with butter” and the “salted butter” (on 2 separate trips) and both were absolutely perfect. Highly recommend. 5. Falafel for Sunday lunch in the Marais. Check! We did this the day after we arrived. Our good friends from San Diego arrived on a Sunday, so we walked all over Paris, with a stop at the Marais for falafel. Once again, the line was 1/2 way down the block (with the poor falafel competitor across the way only having a measely handful of people). We realized that our falafel place, L’As du Falafel, received rave reviews in the New York Times, which explains the sudden boost in diners in 2006. 4. The incredible dairy section at any grocery store. Check check check! Mmmm….I LOVE the yogurts in France. Nuf said. 3. Being mesmerized by the selection at the cheese shop down the street from us. 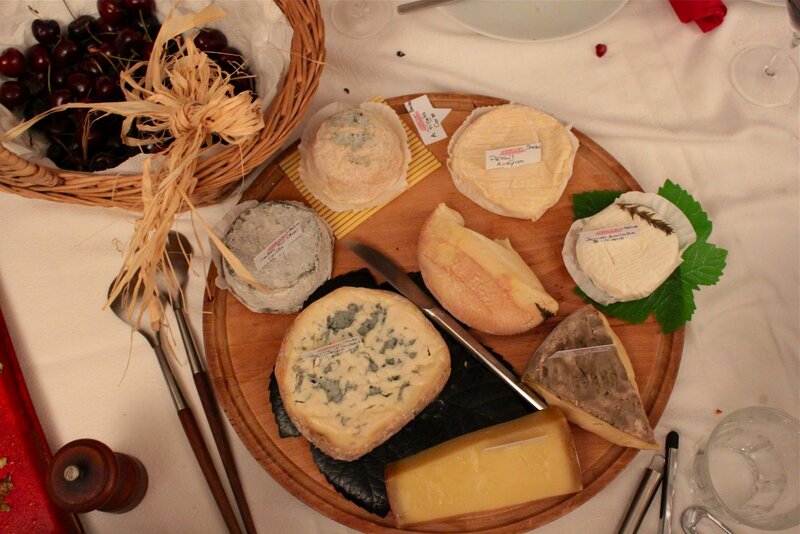 And then asking for a camembert, “bien prêt” (meaning, “ready,” which for a camembert means “soft & flavorful”). 1. …Macarons from Pierre Hermé and Ladurée! Okay I realize that I kind of cheated on this one by combining #2 and #1. But the macarons really deserved to be separated from the rest of the patisserie world, in my opinion. And yep! I definitely took full advantage of the pastries and the macarons. Tomorrow, a friend and I will attempt to recreate the beauty by whipping up some Macarons Caramel Fleur de Sel…and maybe Macarons a la Rose. We shall see! So what do you think? Do I get an “A” for “effort” on my foodie top 10? Cuz I can tell you, it was rough. …(kidding! )… What would be on your foodie top 10 (in Paris or elsewhere). EDIT: Okay looking at this post I realized that it was way too hard to differentiate between the original top 10 and the “reviews,” so I added bullets to the reviews. Hope this makes the post easier to read! This entry was posted in french, gourmet, new york times, vacation on July 13, 2009 by seedsowingmama. The New York Times is going local again. An article from nytimes.com described how a San Francisco man started a business where he comes to your house and creates an organic vegetable garden for you, right in your backyard. He also weeds, harvests the produce, and then leaves the vegetables for you on your back porch. Wow. I have to give the guy props for a brilliant business idea. I imagine that he can charge a pretty penny for his gardening services, and he gets to do something he loves (hopefully) without having to own any farm land himself. In addition, he avoids having to market and sell his produce during the tiny window between ripeness and rot. Bravo! However, it did strike me as odd that people would actually pay someone to do this. If your motivation is fresh, local produce, why not just go to the farmer’s market or join a CSA? And if you really are passionate about seeing your vegetables grow from seedlings, it seems to me that you would also want to have a hand in growing them. That’s part of the fun! What this indicates to me is that there’s another motivating factor at play here- trendiness. Apparently, local food is becoming trendy, like pomegranates or flax seeds, and frankly I’m a bit conflicted about it. On the one hand, I am glad because it means that more people will be buying local food, which means more money will go to the farmers. But on the other hand, I’m afraid that “trendiness” will become “elitist” and that mainstream Americans will come to believe that local produce is somehow unattainable. This would definitely be a step in the wrong direction. Delicious, healthy, seasonal food as a trend is almost comical. There seems to be some sort of role reversal here. Fresh tomatoes in December. Now that’s elitist. I hope the trend stops before it’s too late for local food to become the norm. This entry was posted in articles, local, new york times on July 24, 2008 by seedsowingmama. Community Supported Agriculture is making headlines! This morning my dad sent me an email with a link to a New York Times article about Community Supported Agriculture (CSA). It was well-written, and a good introduction to the concept of CSAs. The idea behind a CSA is that customers pay up front (either for the season or the year), for a share of a local farm’s harvest. The specifics of different CSAs vary, but in general, customers choose how much produce they think their family will eat each week, and sign up for a share corresponding to their needs. The customer pays in advance, based on the amount of produce they chose to receive. The CSA will then package everyone’s share based on the produce they have available that week, and either deliver it to the customers, or have the customers pick up their produce at the farm, or some other designated location. Our CSA is called Eating with the Seasons. The produce comes from several local farms and once the produce is all divvied up there are pick-up locations all over the Bay Area. We pick-up our share only 2 miles away from our house, making it very convenient. One unique thing about Eating with the Seasons is that they email you a list of available produce each week, and you get to choose which items you would like that week. This means that if one week I’m planning on making a spinach quiche, I can order spinach. Or, if I still have produce left over from the previous week that I need to use up, I can order more fruit and root vegetables. I love this flexibility. Another particularly cool thing about our CSA is that you can order local, grass-fed beef, lamb (seasonally), and chicken (seasonally) in addition to the produce. They also have other local or fair trade products, such as jam, granola, coffee, olive oil, and eggs. Everything is organic and fresh. Not only is this a great deal for me, but it’s a great deal for the farmers, and allows for smaller farmers to stay in business without having to worry about dealing with large grocery store chains that generally don’t like to do business with small farms. If a large grocery store DOES tell a farmer early on in the season that they would be interested in buying their produce that season, the grocery store is not bound to the farm when the time comes to buy. This means that a whole season of work can end up going to waste if the farm is not able to line up a buyer when their produce is fresh. CSAs allow farmers to get paid in advance, assuring them that the work they’re putting into that season will not go to waste. To find a CSA in your area, check out Local Harvest. The website will allow you to search for CSAs or farmers markets anywhere in the US. Good luck! This entry was posted in articles, CSA, new york times on July 10, 2008 by seedsowingmama.